Everyone can agree that a beautifully designed wedding venue makes a world of difference not only in photography but also in the overall atmosphere of the event. Even if you have gorgeous floral arrangements, however, without proper lighting these centerpieces won’t be visible as the night unfolds. Candlelight alone, won’t do it unless of course, it is a million candles. On the other hand, lighting works without flowers, extravagant rentals or sophisticated tableware. It can carry the ambiance for your reception entirely by itself. 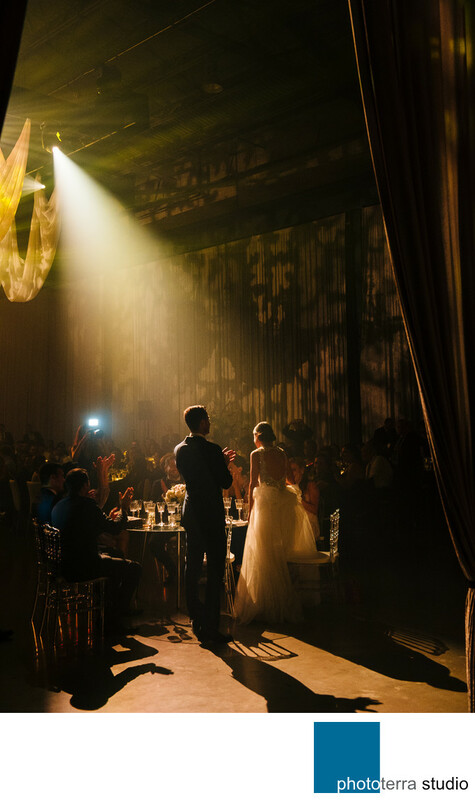 The right illumination, like the one on this reception photograph from the Arsenal Contemporary Art Gallery wedding in Montreal, QC, can compete with any decor or wedding design. The photographer chose an unusual angle for this image. By standing behind the bride and groom at a considerable distance as if peering from behind the curtains, he was able to capture the beam of light directed at the bride during her speech, the dancing lighting shadows on the walls of the venue and the applauding hands of the groom and guests — a perfect example of wedding photojournalism. The photography duo of this event, Michael Greenberg and Anouk Landry, were published online by Junebug Wedding blog. The photo credit for this particular picture goes to Michael. Location: 2020 William, Montreal, Quebec H3J 1R8.